Below are listed books related to the history of Carnarvon and its immediate environs. Where available, details of how to purchase the books are also included. 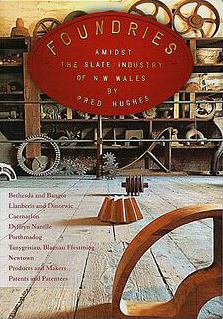 A look at the various foundries operating in north west Wales and their connection to the Welsh slate industry. Areas covered are: Caernarfon, Bethesda & Bangor, Llanberis & Dinorwic, Dyffryn Nantlle, Porthmadog, Tanygrisiau, Blaenau Ffestiniog, & Newtown. 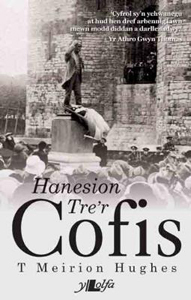 A volume of articles and photographs chronicling the history of Caernarfon and her people - a taste of what the readers of Papur Dre have read over the last decade in the articles of T Meirion Hughes. 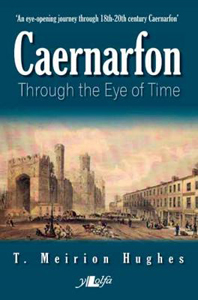 From historic ships and shipping families, riots and flag burning to recreational and leisurely activities through Caernarfon's vivid past; Caernarfon through the Eye of Time takes us on an eye-opening journey through 18th-20th century Caernarfon. If these Castle walls could talk. 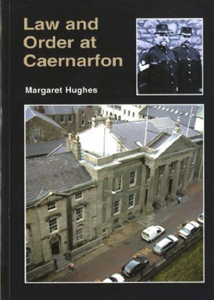 Written by popular local historian, T. Meirion Hughes in his distinctive congenial and informative manner. 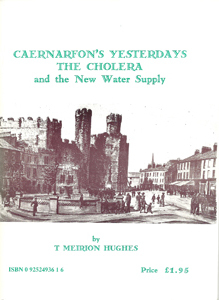 An account of the terrible cholera outbreak which hit Caernarfon in 1866, and its aftermath; including the setting up of a new fresh water supply to the town. Out of Print. Can usually be found in good used book shops or sometimes on eBay. 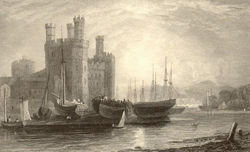 An overview of the history of the ferries crossing the Menai from Caernarfon to Anglesey. 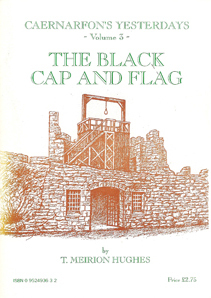 An account of the executions which took place at Caernarfon and Beaumaris prisons. This book tells the story of a disaster that occurred in the village of Cwm-y-glo, between Llanrug and Llanberis, in June 1869. It is not known what caused a load of five tons of nitro-glycerine to explode while being transported. Accident, neglect, or sabotage? Stories about routine events such as births of children, the day to day business of running the town, burial, the health of the town, superstitions, medical knowledge, good and bad days of the town, &c. mostly from the first-hand knowledge of the author. 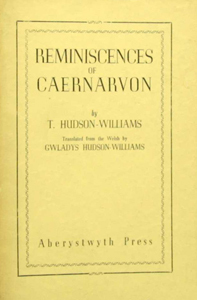 Translated from the Welsh by Gwladys Hudson-Williams. 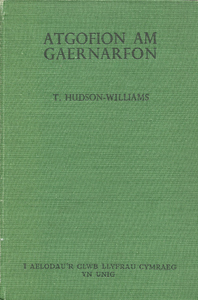 This book traces the development of law-keeping (and law-breaking) in Gwynedd from the early days to the present day, reflecting changes in society but also underlining the unchanging social problems which beset every generation. 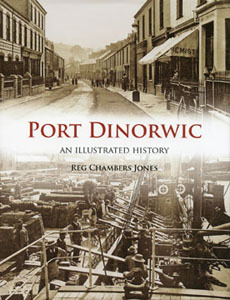 Port Dinorwic – an illustrated history tells the story of the village of Y Felinheli which is a microcosm of the history of central Caernarfonshire during the period 1850–1960. It developed from two small hamlets into a significant port for the export of slate to far-flung corners of the world. 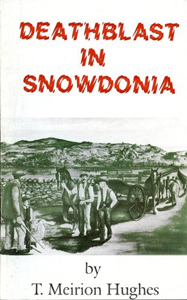 The population grew from a few dozen agricultural workers to several thousands who worked in the slate industry, centred on the great Dinorwic Quarry in Llanberis, or in the industries and services, such as ship building and retailing, which developed alongside the port. The Menai Strait, separating the island of Anglesey from the mainland, has historically been a major obstacle to communication in north-west Wales. From the earliest recorded crossing by the forces of the Roman general Suetonius Paulinus in 61AD, to the completion of Thomas Telford's suspension bridge in 1826, this narrow stretch of water caused travellers to take their lives in their hands. 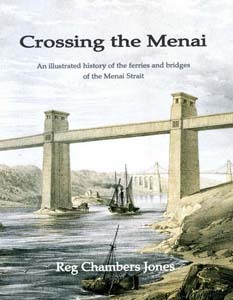 Crossing the Menai chronicles the story of the various ferries that operated for hundreds of years and the two bridges that were hailed as marvels of nineteenth-century civil engineering. 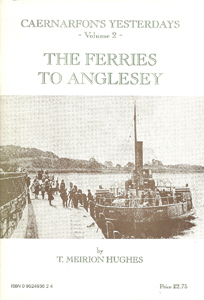 Profusely illustrated, in both colour and monochrome, this book examines both the people (ferry operators and passengers) and the boats that crossed from Bangor to Beaumaris and Porthaethwy, Y Felinheli (Port Dinorwic) to Moel-y-Don and Caernarfon to Tal-y-Foel, Aber Menai and Aber. Two chapters are devoted to the construction of the Menai and Britannia Bridges and a final chapter examines the pleasure steamers that made the longer journeys from Liverpool to Llandudno, Beaumaris, Bangor, Menai Bridge and Caernarfon. Interest in the Second World War has undergone a great revival in the past few years, particularly with regard to the effect of the war upon the lives of ordinary people. 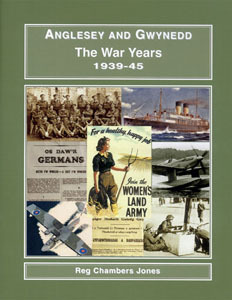 This book examines in some detail how north-west Wales, the present-day counties of Anglesey and Gwynedd, were affected by the tumultuous years between 1939 and 1945. Almost overnight, every corner of Britain came under a command economy with all sections of the population organised into various forms of National Service – compulsory military service in the Royal Navy, the Army and the Royal Air Force; munitions workers; ship builders; the Home Guard; Women’s Land Army; Air Training Corps … Even farmers, traditionally independent and only affected by the economic changes brought about by previous wars, became highly regulated under the Ministry of War Agriculture. North-west Wales proved a relatively safe haven, not only for evacuees from the large conurbations of England, but also for the BBC, the Inland Revenue and the paintings of the National Gallery. When peace was restored in 1945, the affect-effects of the war were felt in the region until the 1970s. All of these aspects are examined in Anglesey and Gwynedd, The War Years. 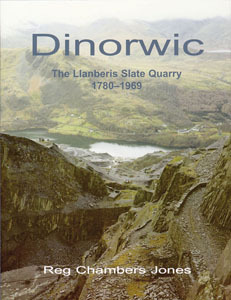 The Dinorwic Quarry at Llanberis, now the home of the National Slate Museum and the Electric Mountain Visitor Centre, was once one of the largest slate quarries in the world. Today the scars of the terraces on the side of Elidir Fach and Elidir Fawr, along with the tips of slate waste, are silent testimony to the industrialisation of this beautiful north Wales valley. The quarry was once the major source of income for many communities, not only in the shadow of the mountain itself, but as far away as the east coast of the Isle of Anglesey from where many workmen travelled by boat and train every weekend to live in the spartan conditions of the quarry barracks. Slate quarrymen were a special breed of highly skilled workers who laboured in what would now been seen as appalling conditions in the face of the prevailing elements, forever running the risk of death, ill-health and serious injury. 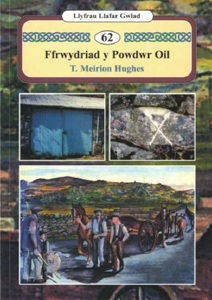 In this book, written nearly forty years after the closure of Dinorwic, the author has, for the first time, painted a portrait of the quarry itself, the men who worked there (be they managers, quarrymen or labourers) and the communities in which they lived. Many of the photographs have never previously been published and should be of interest to not only students of industrial archaeology but also to the former slate quarry workers and their families as well as to local and family historians. The section on transport will have a particular appeal to those interested in industrial railways.